Car hire in Madrid...the best and most pleasant way to discover Madrid’s most characteristic areas, or equally interesting areas. You will discover some of Madrid’s many secrets, and when we say Madrid, we mean the many facets of this charming city: happy and caring, dynamic and modern, cosmopolitan and welcoming; a single city with a multiplicity of characters. Madrid is city full of culture, with wonderful monuments, entertainment and great food; but at the same time, it is an ecological and environmentally friendly city. See our fleet of car hire in Madrid and enjoy your car hire in Madrid. 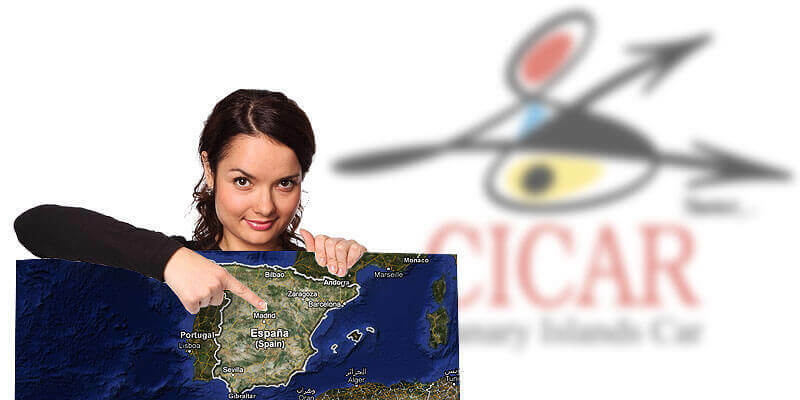 Enjoy the CICAR quality of service and satisfaction guarantee anywhere in Madrid. Now in Spain mainland & Balearic Islands! By renting a vehicle from Cicar, users will receive a audio guide of Madrid*, containing descriptions of places of tourist interest around Madrid. (*) The audio guide can be integrated into the car audio system or delivered in CD Mp3 format. Your car hire company in Madrid and all the Canary Islands. With offices at all the airports, sea ports and main holiday areas*. sea ports and main holidays areas.